AMC-128 has a Hitachi 1.8 inch 20GB which operates at 4200 RPM and is housed in a virtually indestructible enclosure. It has both USB 2.0 and USB 1.1 compatibility and offers a very small-footprint. The AMC-128 OTG Disk Package supports extremely high data transfer rates of up to 480Mbps (USB 2.0) for blazing fast transfer of large multimedia files. 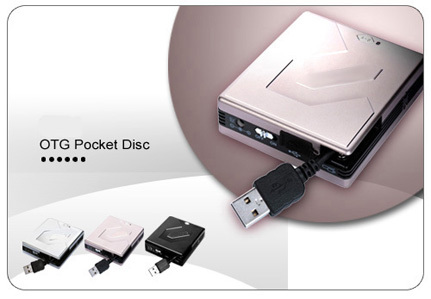 It is also supports backward compatible with USB 1.1 specifications. This enclosure is very easy to connect to your PC or Mac desktop or notebook is hot-swappable, Plug-n-Play, and can run applications directly from the device. AMC-128 is backed by a 1-year Limited Warranty. No external power supply required. No software required for installation.